You are here: HomenextPeoplenextPlayer ProfilesnextMillard, Sydney "Syd"
Syd was born at Deerhurst in 1884, the second son of William John, a farm servant, and Alice Millard. The family lived at Hatchs Farm, Gloucester Road, Deerhurst (1891) but by 1901 Syd was living with his mother, now a widow, at Pincote Farm, Upton St. Leonards, although by 1911 he had moved to Malvern. At 16 years of age he became an apprentice upholsterer and was subsequently employed by Mr Richard James, Northgate Street, Gloucester. In 1909 Syd, a second row forward, joined the Gloucester Club from Gloucester Old Boys and made 130 appearances of which seventy-eight were for the First XV up till end the of the 1913-14 season. Syd scored five tries for the Gloucester A side. At the end of 1913-14 season The Citizen summarised the pack’s contribution to the season by stating that Syd, along with Norman Hayes, Arthur Saunders, George Halford and Sid Smart, formed “…the backbone of the forwards [and] were a distinguished quintet in all phases of play”. 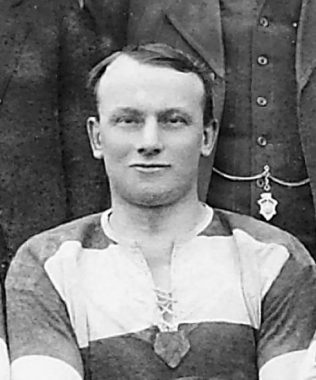 Syd’s contribution to the Club was recognised by the inclusion of his name on the Honours Boards which now hang in the Lions’ Den, for the 1912-13 and 1913-14 seasons. The County selectors also acknowledged his skills and he was awarded two County caps against Hampshire and Cornwall in the 1913-14 season. Syd enjoyed cricket during the summer months and was a member of the Gloucester Nondescripts Club. However, along with a great many other Gloucester rugby players, Syd’s career was cut short by the outbreak of the Great War in 1914. Syd joined the 5th Battalion, Gloucestershire Regiment and rose to the rank of Sergeant. On 23 July 1916 the battalion was on the Somme and had received orders to attack a particular section of the fortified village of Pozières. The 5th Gloucesters attacked, with at least twenty-six Gloucester rugby players in its ranks, uphill through a shallow valley with German machine gun on three sides of them. The attack failed with a large number of casualties. The 5th Gloucesters’ Chaplain, the Reverend George Helm MC, wrote that Syd, along with several others, were seen to jump down into a German trench from which they did not reappear. The following day the German trenches were captured and it emerged that only four soldiers from the 5th Gloucesters had managed to make it to their objective and all were subsequently killed. Three of these soldiers were the Gloucester players, Syd Millard and the brothers Tom and Melville Lewis. The body of a fourth Gloucester player, Sidney Sysum, was found on the trench parapet, killed as he was about to jump down into the trench. Although their bodies were identified after the attack and buried, the ravages of war, particularly the 1918 battles which were fought over the same ground, resulted in their bodies not being found after the war and all are commemorated on the Thiepval Memorial to the Missing on the Somme, 1916. Of the remaining members of the 1913-14 “quintet” Arthur Saunders was killed on 1 November 1916 after being awarded the Military Medal for bravery and is also commemorated on the Thiepval Memorial, George Halford was invalided out of the Army in February 1915 having sustained a shrapnel wound to his right side, while Sid Smart after several woundings was also invalided out of the Army in April 1919; Norman Hayes worked in a reserved occupation. There is no doubt that Syd Millard would have had a longer career with the Gloucester Club had it not been for the Great War which ended his life aged 32 years.